Powerful editing software tool for live video streaming. Powerful editing software tool for live video streaming. Its main functions are automation and content creation for VOD and Catch Up TV libraries. The C21 Live Editor allows you to perform extractions, cuts and selection of video segments of any live streaming broadcast as it happens. Frame level accuracy. Any operation done with C21 Live Editor has an exact and direct effect on the content you are viewing. Simultaneous editing conversion. Visible fast-forward and rewind with frame accuracy. Play at any time to control its edition, test the audio, x8 speed and create an editions in different formats than the original. Integration with CDNs and live streaming services. Adding VOD distributionthe capability of performing the VOD distribution during the event. AsRunLog integration. The AsRunLog integration helps makes it possible to find elements, programs, and to perform selection and edition tasksoperations in accordance with the broadcaster processes. Virtualization support. Software virtualization allows for quick set up on client hardware or on a private cloud. Software, cloud based and appliance editions. To adjust to the needs of the customer with options ranging from pay-per-use to the purchase of perpetual licenses. Intuitive web, API and SNMP management. Reduce the challenges of management and monitoring, and the integration with third-party systems in order to automate the editing processes. Continuos 24/7 operation with engineering support services made available in order to ensure a perfect continuity of its services. Diagnostic tools. Ensuring an easy diagnosis of the problems which might arise thus reducing the downtime in case of any system failure. Your very own VOD y Catch Up TV libraries without having to wait until the event has ended. While the event takes place, you will have access to all the content for editing. The timeline tool lets you navigate freely throughout the recording. The clips you select will be available for monetization at the location of your choice. Power from the Web browser. Based on Web tools, the learning curve is of a negligible value and does not require any special client or software installed at the stations. Integration with C21 Live Cloud services. 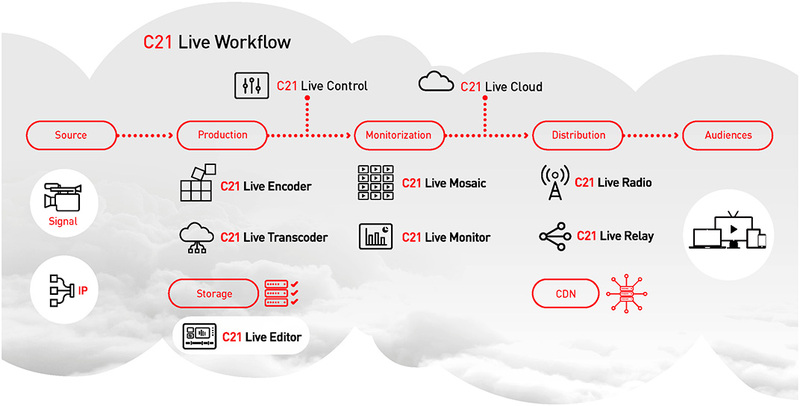 Opening a new range of possibilities with the components of C21 Live Cloud: C21 Live Encoder, C21 Live Mosaic, C21 Live Monitor and C21 Live Control. Operating model. Based on C21 Live Cloud, SaaS o appliance service, it ensures an easy adaptability to any business model. The C21 Live Cloud Editor service allows its users to perform a light editing in order to pusblish directly in a CMS or to simultaneously produce clips of any quality and format simultaneously. These clips can be stored locally or in the cloud. The option of a private cloud enables a user to make use of the virtualized software as part of his own hardware resources, in order to have access to a cloud solution at the location of acquisition to the point of broadcasting content, minimizing the initial investment. Encoding resources optimization: the option of activating only what is needed and at the same time to changechanging the amount of encoding resources in real-time, opens an opportunity to new encoding projects forin which the investmentinversion would be, otherwise, unaffordableimpossible. Global reach: encoding resources are available in different areas of the world.